The Head of the Ukrainian Greek Catholic Church, His Beatitude Sviatoslav, is making his first pastoral visit to the United States. The UGCC Primate is visiting Chicago where he will participate in the celebrations on the occasion of the 50th anniversary of the foundation of the Ukrainian Catholic Eparchy of St. Nicholas. As the Chancery of Chicago Eparchy reports, on September 22, the Head of the UGCC was met at the airport by Eparch of Chicago, Bishop Richard (Seminak), and representatives of the clergy and lay people. The Head of the Ukrainian Greek Catholic Church, His Beatitude Sviatoslav, is making his first pastoral visit to the United States. 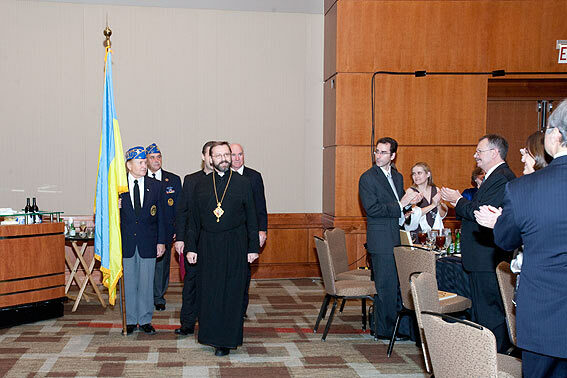 The UGCC Primate is visiting Chicago where he will participate in the celebrations on the occasion of the 50th anniversary of the foundation of the Ukrainian Catholic Eparchy of St. Nicholas. As the Chancery of Chicago Eparchy reports, on September 22, the Head of the UGCC was met at the airport by Eparch of Chicago, Bishop Richard (Seminak), and representatives of the clergy and lay people. The next day, the UGCC Primate celebrated a Divine Liturgy for students and teachers of St. Nicholas School in Chicago. After the Liturgy, the hierarch met with the students and teachers addressing them in Ukrainian, English and Spanish witnessing in such a way the unity of the Church and faith in diversity. After the meeting with the students, His Beatitude Sviatoslav dedicated much time to Ukrainian and US journalists answering their questions. In the evening of that day, the Head of the UGCC visited a special exhibition on the history of St. Nicholas Eparchy in Chicago at the Ukrainian National Museum. The exhibits included many religious editions and various historical documents, as well as personal belongings of Metropolitan Andrey Sheptysky who visited the Parish of St. Nicholas in Chicago twice - in 1910 and 1922. “One can say without exaggeration that the jubilee marks a special moment of God’s grace, the power of the Holy Spirit with which the Lord builds and develops His Church and spreads His kingdom among us,” - said the Head of the UGCC at the anniversary banquet. According to His Beatitude Sviatoslav, the existence of the Eparchy itself, as an important part of the Ukrainian Greek Catholic Church, its establishment, activity and this jubilee are a great gift of God.